Located about 30-minute uphill drive from the coastal town of Fethiye, Kayakoy is one of the must-go places when you are in the region. Unlike many touristy areas, this is where you can really enjoy a quiet trek among many abandoned buildings. Because of this, Kayakoy is also known by many as a ghost town – not a ghost town because its haunted but more because it has been abandoned and many of its house left crumbling to pieces without maintenance. Back in the 1920s after the Greco-Turkish war, the Turkish and nearby Greek government did a population exchange. About 2000 people, almost all Greek-speaking Christian were moved from the village of Kayakoy to Greece and Turkish-speaking Muslims were moved from Greece to different parts of Turkey. With this huge move, the houses were all left behind and exposed to elements of nature and over the past 80+ years, the buildings have gradually been reduced to ruins with some of the structures and frames of houses still standing. To catch a bus to Fethiye, go to the Dolmus (mini-bus) station which is about 8-minute walk due East from the Fish Market. 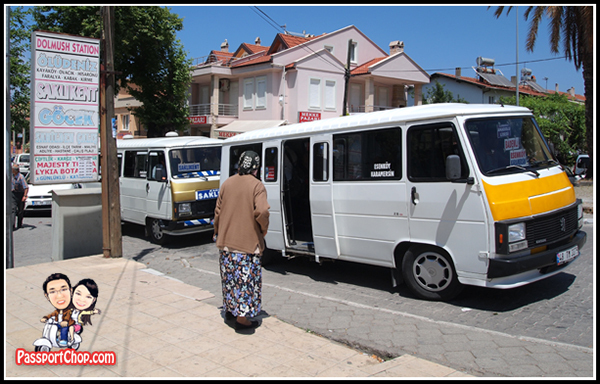 There, you will find many mini-buses going to different areas around Fethiye e.g. Oludeniz and Hisaronu, all for about 4-8 TL. If you want to trek all the way to Kayakoy, that will take about 1.5-2 hours. There are many well-established trekking routes leading to these places. Entrance to the Kayakoy village costs 8 TL per person and the fee is collected at a small hut by the entrance to the village – although if you are here early in the morning or late in the day, the hut might be unmanned and you could get in free. There are well marked trails leading to more well-known ruins in the village. Most of the time, this area is deserted so you will have the entire place to yourselves other than a few hikers. You might even see some goats roaming the grounds, chomping away at grass, oblivious to your presence. They are easily spotted from the noisy bell hanging on their neck. 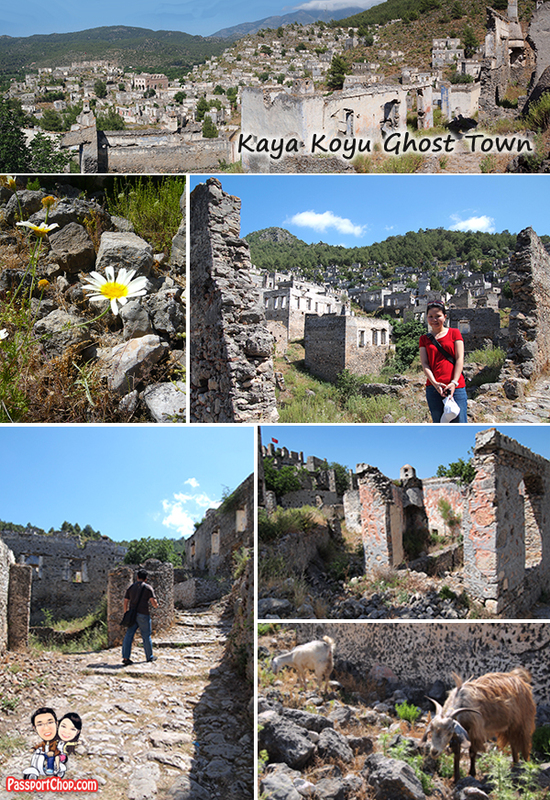 For an idea of how isolated this ghost town of Kayakoy, check out this video we took of the surroundings. There is no formal map of the area but it will be difficult to get lost since most of the places are just ruins and you can see further away to even where you started. 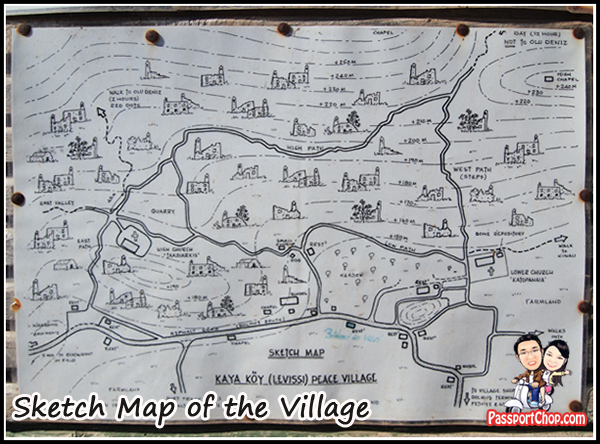 Check out this rough sketch of the Kayakoy village if you need a guide. 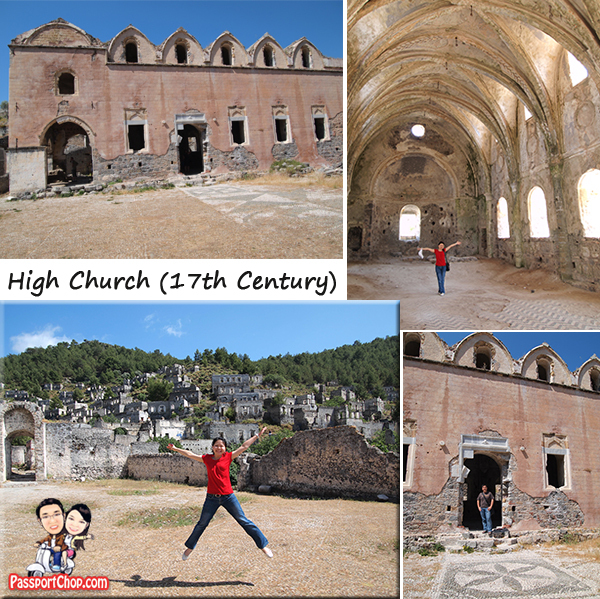 The most popular attraction of this Kayakoy ghost town had to be the High Church – one of the best preserved building in this village. Mosaics on the floor leading to the church is still very visible and the church frame and structure is still very much intact. Not bad for a building that is over 400 years old.